On October 24, 2008, I became a fan of the Saw franchise. That’s an oddly specific date to remember, I know, but it’s the day the fifth Saw movie came out. I attended a marathon of the first four movies leading into the fifth one and all at once realized the horror franchise’s genius. Yes. I said genius. For those who may not know, the Saw franchise is about a serial killer named Jigsaw (played by Tobin Bell) who captures people who have done something heinous and punishes them by putting them in horrifying situations. Usually they involve forcing the captives to make impossible choices: Tear your own eye out or have your skull crushed. Kill someone or let them kill you. Some of the scenarios are incredibly elaborate, some aren’t, but they’re almost always about forcing the victims to pay for their mistakes in very specific, gory ways that are thematically appropriate to their sins. So far there have been seven films and, on a reported budget of $68 million total, they’ve grossed over $950 million worldwide. But what I learned on October 24, 2008 was that the Saw movies are best viewed not as movies, but instead as 90-minute episodes of an R-rated TV show. It’s a bloody soap opera filled with impossible (and sometimes laughable) twists, turns, returns from the grave, and surprise familial connections. It’s all the stuff that makes trashy TV so entertaining, and when you think about the Saw movies like this, they’re much more enjoyable. The storytelling is hyper-serialized almost to a fault. Most of the films start almost exactly where the last one left off, often using footage from the last film. Plus there’s the incredible fact that the seven Saw movies were released annually, each October, from 2004 though 2010. That’s as close to a TV schedule as is possible for a movie franchise to get, and it’s nearly unprecedented in modern cinema. Watching parts one through five back to back in that theater made me realize the fact that a few of the movies were so much worse than the others didn’t matter, because it was impossible to separate them. It’s just like sitting on your couch to binge a show on Netflix; because you’re watching the episodes one after another, they sort of blend together. So if one episode (or in this case, movie) isn’t very good, it’s okay, because there’s always another one coming. And even if that one isn’t great either, you’re still invested in the overall story, because they still build on each other, creating a tale that is significantly more than the sum of its individual parts. The best example is the link between Saw III and IV. The two films take place at the same time. They have different characters and different settings, but they’re crucially linked through Jigsaw and his minions, and both storylines come together at the end. If you only watched one of the films, you’d basically only be getting half of the story. If you watched both movies, but a year apart, chances are you wouldn’t remember enough about the third movie to see all the ways the fourth film connects to it. Slowly you realize when movies link together that closely, quality doesn’t really matter as much. Every single one of the Saw movies, even the original one, are rotten on Rotten Tomatoes. Hell, Saw 3D, the seventh and most recent film, has a putrid nine percent, which is probably why the franchise hasn’t released a movie in seven years. And those ratings are warranted. But the critics reviewing the films on Rotten Tomatoes were reviewing each one on its own, a year separated from the previous installment. Little did they know that’s not the ideal way to experience this franchise. Now, I’m not saying this is some kind of revelatory thing. Saw didn’t revolutionize filmmaking, bingewatching, or anything like that, and plenty of films have told concurrent stories or have been closely linked together, basically as long as movies have been around. But somehow Saw, in this day and age, just feels so much more committed to it. Apart, the films are disposable; together, they can be genuinely enjoyable. 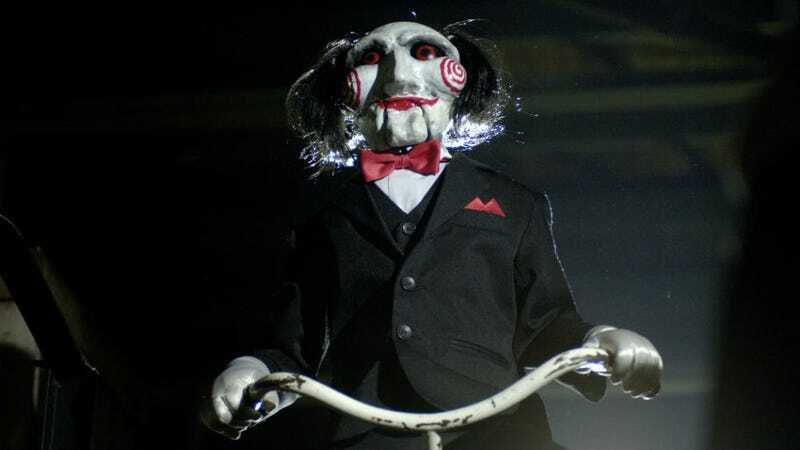 It’s been seven years since the last Saw movie was released, and the eighth movie in the franchise, Jigsaw, finally premieres this week. There are no reviews in for the film yet, but it doesn’t seem impossible that it may end up with a thoroughly rotten Tomatometer. But if you’re crazy enough to see this newest installment after an 11-hour bingewatch of the previous “episodes,” I bet the thing that will shock you the most is that you’ll enjoy it, no matter what.